I paid for JAMB form online but I was not given the PIN for my registration. I paid my change of institution charge of N2500 at a bank. But when I returned to JAMB profile, the payment did not reflect. What can I do with that? I made payment for my admission letter N1000 online but it did not show that I have made the payment. What should I do to print my JAMB admission letter? I paid for JAMB regularization at a bank. When I log in to my profile, it is still asking me to make a new payment. I paid for my JAMB original result online. My bank account was debited but it did not show that I made payment in my profile. This is a challenge many candidates are facing while making payment for JAMB stuff online or at banks. But if you look at the situations above, you will notice the problem is generally the same and it is about the payments not REFLECTING BEING MADE. See also: How Long Does JAMB Change of Institution/Course to Reflect? If you’d made the payment online i.e through using your ATM card, be sure first that your bank account has been debited before expecting any reflection. With that said, follow the guide below to reflect your payment so as to print your original result, admission letter or continue with the change of institution/course or regularization. 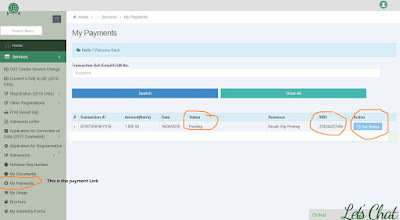 The screenshot showing payment status and how to revalidate. When you’re on your dashboard, locate “My payment” at the bottom right. On the resulting page, locate the payment narration that corresponds with the RRR you paid with. By now, your payment should be successful and reflect. After this, check if you can now continue with your activity – be it JAMB form, change of institution or course, JAMB regularization, admission letter or result. If the above doesn’t work, it could just be temporary portal issues with the body. Give it some hours, return to the portal and retry. See also: Can JAMB Give Admission from Two or More Schools to a Candidate Through CAPS? Apart from the payment for JAMB form (which can be made through Interswitch and Remita), all other payments are strictly through Remita. When you use Verve Card for JAMB form payment, you're more likely buying your PIN through Interswitch. If a value is not given after paying for JAMB form through Interswitch, locate the option “Requery” to reprocess the payment. This should revalidate your payemnt and give you the PIN. If the Requery option is not available, please wait awhile – until it’s made available. See also: Post UTME Form Already Out! Hope Not Too Late to Change My Schools or Courses? Can you help someone solve this kind of problems by sharing the post with your contacts in Facebook, Whatsapp and Twitter? Use the share icons below this post to get it across to them. It equally means a lot to me.